JP Liz is one of a kind. I was searching for an officiant with something special. I wanted personal, emotional, humor, Structure, and organization. She was all of that and more. We are still getting compliments on how well our ceremony was done. It was truly perfect. Liz understands what a couple wants, and is not afraid to let you know what will work or will not work with your wedding. She made sure we were prepared, organized and on time. We cannot thank her enough. We are very happy that JP Liz married us! 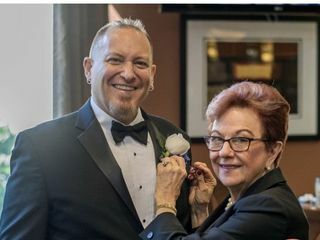 She has many years of experience officiating and planning weddings and it shows. She helped us plan a ceremony that was the perfect fit for us. She had great ideas and also thought of details/ issues that we had not considered. Thanks for everything, JP Liz! Elizabeth was excellent! She was very personable and professional and very accommodating. We met on multiple occasions and she made us very comfortable with the ceremony planning process. She did an amazing job at our wedding and we highly recommend her. 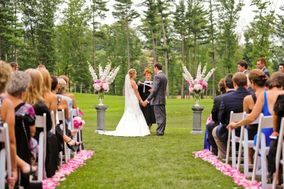 JP Liz came to us as a recommendation from our venue (Fenway Park). I reached out to her via email and she responded almost immediately. She was very flexible with meeting us and guided us every step of the way. I would highly recommend her. We would definitely recommend Liz to anyone looking for a Justice of the Peace to marry them. Liz was so kind from day one and so excited for us! She really made us feel comfortable and we weren't nervous at all for big day because she talked us through our day so perfectly. She met with us multiple times and did a very detailed rehearsal so everyone knew what to do and where to stand. She was just amazing! Elizabeth is one of the most incredible person you’ll ever meet. She is definitely an accessory to making your BEST day perfect. She’s so kind, understanding and most of all the sweetest. Everything I wanted or had questions about she made sure to clarify. It was all about what the brides wants the bride gets. Love her to the moon and back! Justice of the Peace Liz is one of a kind. We spent many months looking for the right person to officiate the most important day of our lives and when we found JP Liz we felt blessed. Her energy and extreme care for ensuring she could tell our story in a genuine way made our ceremony one we will never forget. She gave us lots of options to choose from so we could add special touches. She was highly prepared and looked really professuonal. 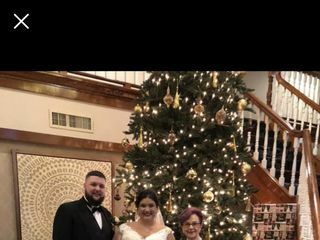 She had everything under control and radiated confidence and genuine happiness to officiant our big moment - Our guest commented how amazing JP was and how much they enjoyed the ceremony above all things throughout the day. JP Liz will forever be at the center of our cherished memories. Alex and I highly recommended JP Liz. Elizabeth was wonderful. Ceremony was perfect, couldn’t have asked for anything more, she truly made our special day special and memorable! There aren’t enough bright words to describe Elizabeth with. We couldn’t have found a more perfect match for our marriage ceremony if we tried. Elizabeth is kind, compassionate, fun, and so incredibly personable. 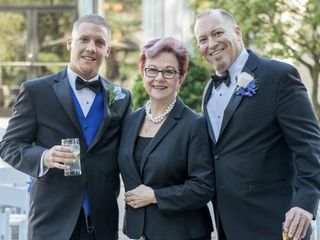 She took the time to get to know my husband and I, and then worked hard to give us a wonderfully customized ceremony. She enhanced our day with a unique Unity Painting and it wasn’t perfect. We will be using her in the future for our children’s baby blessings! We can’t love her more! Thank you, Liz! Elizabeth is so warm and compassionate. 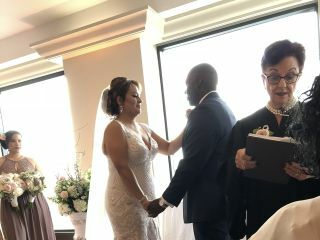 Our guests are still raving about the ceremony and how much they felt they were a part of the wedding thanks to Elizabeth's words and enthusiasm. She goes the extra mile to make sure everyone is happy! Elizabeth was wonderful. 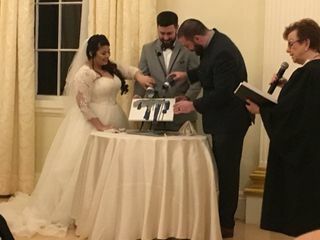 She helped us put together our wedding ceremony exactly the way we wanted it. Actually, people were complimenting us on it--which I know isn't the point of getting married but it was nice to hear that people found it moving. She was great at coordinating our families and bridal parties, no small task, and was so professional for the entire process. You were absolutely wonderful! We couldn’t have imagined anyone better. Thank you so much for being part of our special day! Not only the best JP, but the greatest, nicest, most beautiful person we ever meet!!!! Liz was such a big part of our day and now is part of our life!!! We will never forget her!!! We love her! Hello to the newlyweds! 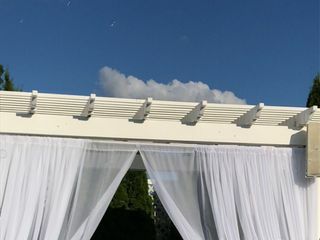 Thank you Gaby and Larry for this great review and putting photos up. Happy Happy New Year and see you early 2018. Liz is so wonderful! After only a few meetings, she is family to us. She gave us wonderful advice and suggestions to ensure a perfect ceremony. Our guests are STILL commenting about her to us, and how impressed they were with her person-ability although we've only known her for months! Liz took the time to learn our love story and created our entire ceremony around it. You will not only have a beautiful, most-personal event but, a friend for life in Liz! She is the best you'll find! 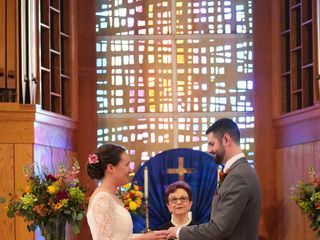 Liz is a wonderful warm person, and brought those qualities and more to our wedding ceremony. She kindly met with us (and brought cookies and tea!) before the day to review the ceremony section by section, and made a special trip into the city to see the garden we selected in advance so she could familiarize herself. She charmed and calmed our families beforehand and the ceremony went beautifully and without a hitch! We loved working with Liz and would highly recommend her JP services. Working with JP Liz as our officiant was wonderful. Not only is she thoughtful, kind and funny but also very knowledgeable of the industry. She helped us with the flow of our ceremony, gave us suggestions on wording and helped us create our own unique Hindu/Christian ceremony. We also found ourselves asking for her advise on other logistics of the day to which she always had a helpful answer. We loved working with JP Liz and would recommend her to all other couples. She is truly one of the nicest people we worked with in the entire wedding planning process. JP Liz was simply amazing! All of our guests agreed. Thanks to her, our ceremony was warm, personal, and beautiful. Liz made us comfortable from the very start of the process. We cannot thank her enough for being such an important part of our special day. Had an instant connection with you! Enjoyed meeting with you every time! You did a wonderful job! Thank u!